"C'mon, just one more line? Who's it gonna hurt?" In my case, the character who has stolen my attention in my work-in-progress is my protagonist’s older brother. This may partially be due to the fact that I based him on Young Mickey Rourke. 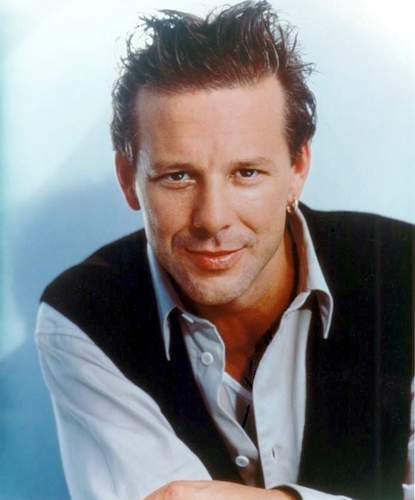 As I am a sort of cinephile, I have been dutifully watching both an array of teen films (my WIP is a Young Adult novel), and anything I can find with Young Mickey Rourke in it for research. I admit, I find Young Mickey Rourke to be nothing short of jaw-droppingly gorgeous with bowl-me-over charisma, so there is this side to the story hijacker that is more powerful than the usual story hijacker. I may spend a little more time than necessary, for instance, studying his facial gestures, the way he speaks his lines, and how he carries himself to fill into the character of my novel. Okay, way too much time. I find myself wanting to write more about this character than the story actually needs, and I give it to him, because of his “stage presence.” Because I have come to a sort of slump in my writing, due to the fact I’ve been on vacation and I’m in the middle of reworking a muddled storyline, I keep wanting to go back to this character because he’s so much fun. One thing I did in my last book was assign a sort of look to my main characters based on actors or people I knew. I’m a visual person, and need a leaping-off point when it comes to appearances so that my descriptions comes naturally to the physical character. Some I had in mind from the first page they were introduced; others I couldn’t find a real physical match until after I was nearly finished with the book. What I found was that for the most part, even the characters who began as these actors, musicians, etc. eventually filled out into their own personalities and morphed appearances so that they didn’t resemble these real-life people at all in the end. I have “base models” for only two characters in my WIP at present, and I’m beginning to wonder if I should assign a look to my protagonist, as he currently has none. My thought behind this idea is that maybe I would gain a new interest in filling out some holes I’ve been procrastinating on with him. There’s something exciting about writing lines for an actor or other real-life person and picturing the words coming out of their mouth. I’m sure this could also be carried out in a more devious way, as well… remember the line by Chaucer in A Knight’s Tale, when he declares he shall write two men who humiliated him into his story and point out all their flaws? It’s sort of a mad game of puppetry, but I would rather look at it as starting with a lump of pre-formed clay and shaping it to fit your story. My hope is that by turning this idea of the story hijacker into a new tool to jolt my protagonist back to life, I will discover new elements about him I didn’t notice before. He’s already a full character with a mess of personality and flaws, but he has some small detail missing that I just can’t put my finger on yet. Now I just have to find someone out there with some slight resemblance to Young Mickey Rourke who I can pin to my protag and pick apart for character dissection. I can't get enough of this crap! Please send me more word vomit! "Help me, I'm a writer"
South of Sanity · The blog of Ara Trask.